For starters, ignore the name. It’s not a marathon. With the distance varying between 87 and 89K, it’s a point-to-point road race swapping direction each year between Durban and Pietermaritzburg. This means it alternates between being an uphill and downhill race with a net elevation difference of over 2,500ft and plenty of bumps in-between. What makes Comrades really special is the size of the field, with 20,000 people each year taking on the challenge. Significantly more than your average ultramarathon! Nothing ventured, nothing gained. A phrase, I’m sure, that can be applied to you and your running journey. At some point – many years ago or perhaps very recently – you decided to lace up your trainers for the very first time, step foot out the door, and go for a run. Whether it was for a school sports day, a New Year’s resolution or simple curiosity, you stepped out of your comfort zone and, presumably, liked what you discovered. This issue is all about pushing boundaries and stepping out – like that very first run – into the unknown. For Adharanand Finn, author of Running with the Kenyans, that meant a trip to California for his first ever ultramarathon: the Miwok 100K. Head to page 42 to find out how steel cups and flat Coke fit into his lessons learned from going ultra. At the sharper end of the field, the pros, too, have been attempting to step (really, really quickly) into the unknown – specifically, by trying to run a marathon in a frankly ridiculous sub-two-hour time. Nike’s recent, high-profile Breaking2 attempt saw Eliud Kipchoge fall agonisingly short with a time of 2:00:25, but what can we mortal runners learn from the event? Turn to page 48 to see how you, too, can maximise performance by echoing the project’s meticulous attention to detail – if not the millions of pounds of funding. 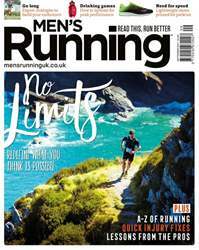 Of course, inspiring stories, cutting-edge kit, training tips and nutrition advice also feature, in an issue made with motivation in mind.